The Mount Pleasant Family Biking Festival is coming up in about two weeks! 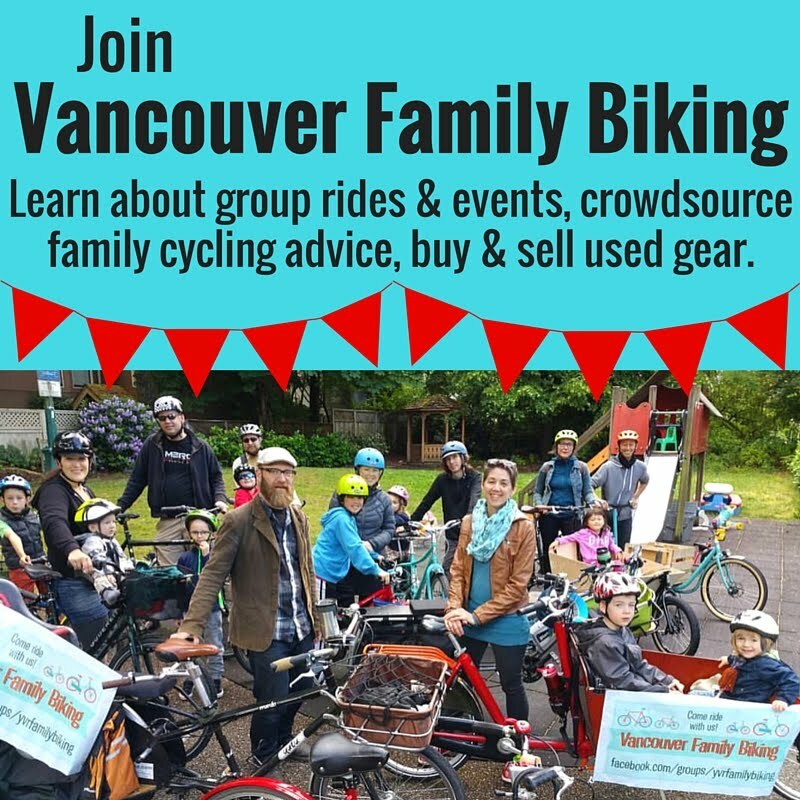 One of the main reasons Tonya & I planned this event is to set up an opportunity for some peer to peer information sharing on biking with kids & babies. The internet is awesome & everything, but nothing beats actually talking to a human being, face to face, right? When you're considering riding your bike with your baby or toddler, or upgrading to something better for your preschooler, it's an important decision. Bike gear can be expensive (though used is a great affordable option!) & your children's safety & comfort is not something you take lightly. Look, touch, taste? You'll get to see a wide variety of ways to carry kids on a bike--from child seats, to trailers, to trailabikes, to cargo bikes--up close & personal at the festival. You might see a kid-carrying setup you hadn't even thought of before that could work really well for you too. Honest answers & real experience. The salespeople in bike shops can often be helpful, but the majority that I've met don't have any actual experience riding with little kids & babies in the seats or trailers that they're selling. Talking to other parents who have experience riding with their kids is the best way to learn about this. Make new pedal pals. 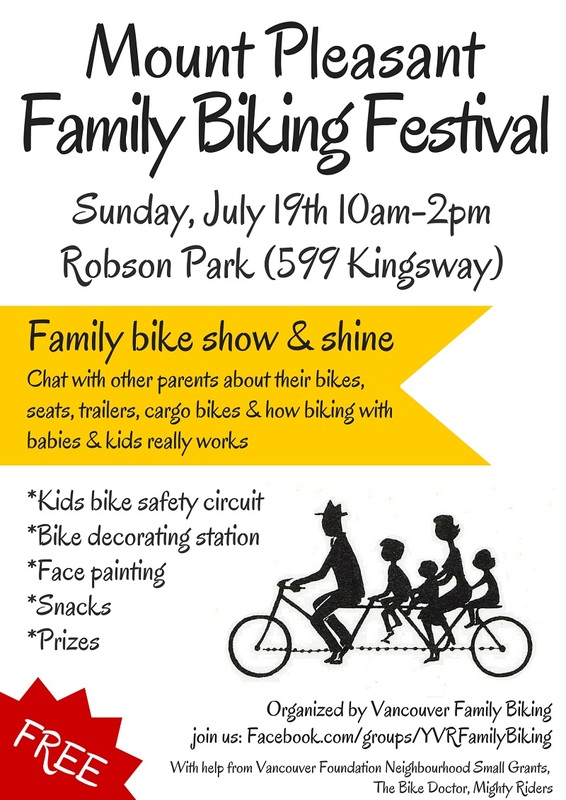 There will be a lot of biking families at the event & information about upcoming family group rides. Whether you're new at biking with kids, or an old hand, it's always more fun with friends, right? Get all prettied up. 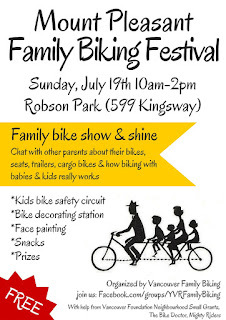 You can decorate your bikes, trikes, or trailers & have your face painted, all for free of course! Win some swag. The Bike Doctor & Tandem Bike Cafe have both generously donated prizes to the event. We'll have a free draw you can enter to win some great biking stuff. Tire out the kids. Bring along the trikes, kiddie cars, runner bikes & training wheels so your little ones can ride the Kids Safety Circuit. Robson Park also has two playgrounds, fenced sports courts, swings & lots of green space for the kids to burn off some steam. Free food. We'll have cool drinks & granola bars to snack on in case you get the munchies. Have I convinced you yet? ;) Hope to see you at the festival. If you're so convinced that you'd like to participate in the Show & Shine, we still have space for more bikes with kid seats, trailers, trailabikes or cargo bikes. The more variety the better! If you can only spare an hour or two, we could always use a little help with the snacks, the bike decorating station, setup or cleanup too. Please let me know if you're interested by email: lisa AT spokesmama DOT com.